HSC Admission Circular 2019. 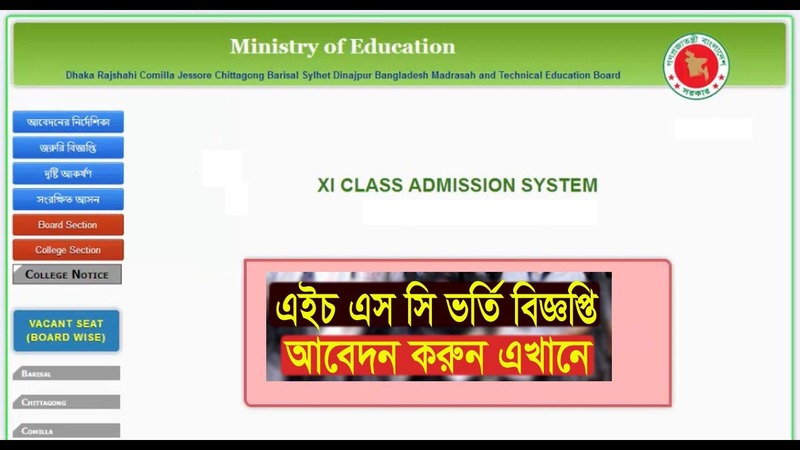 XI Class admission Circular will start 12th May 2019. When will be published this admission circular 2019 same time we will be published here. Students can download his admission circular by his page. Bangladesh all education board Higher Secondary school certificated admission 2019-20 will publish same time. Students can be all information download by this page. We also will be published HSC Admission Result 2019 from our website. So if you want to any information about HSC Admission Result 2019 can be here. Xi admission circular 2019 will be published soon. Before publish SSC result will be published XI Admission Circular 2019. So if you want to need any information can be here. Admission process completed on June 30, 2019. Students can also apply online and SMS. College admission depends on SSC & Dakhil Result. Students who will get better merit position in public exam, they will get a chance in the best college. No admission test will be held except Notre Dame College Dhaka. Applicants have to apply through SMS. HSC Admission Release slips application period 9-10 July 2019. All application must be completed by online process. The Student Who Passed SSC from Bangladesh Open University of the Passing Year 2016, 2017, 2018 and 2019. Many Students want to know when will be published xi admission notice 2019. We have given you this admission all updated information by this post. As a result, can students can check any updated information of xi admission circular 2019. We also will be published xi admission date, Petrobangla job exam result and more. So you can easily download your nursery information by this page. Interested candidates can apply online. www.xiclassadmission.gov.bd is the official website of HSC Admission 2018. When you will go for apply, you must take heavy care to fill up the admission form. After confirmation of correction, then submit your form. Here we tell all the information below, please follow the rules below. To Confirm your Application, please pay 150 Taka by a Teletalk Mobile. All of the students can apply for HSC Admission by SMS too. For this, you must need Teletalk mobile SIM. SMS fee 120tk per college. CAD<Space>College EIIN<space>First 2 Letter of Desire Group<space> First 3 letters of Your SSC Board<space> SSC Roll<space>Passing Year<space> Registration Number <space> Name of Shitf<space>Version<space> Quota send to 16222. After you have Successfully completed application, You will get an SMS with a Pin number. Receive Confirmation SMS and you will get in your mobile above-mentioned Your Name and Tracking Number. if you found any wrong in an online way just see below no for help. HSC Admission Result 2018 publish recently. Here you must be find HSC Result 1st Merit List, 2nd Waiting List. Readingbd.com is an Educational web portal of new generation people of Bangladesh. Here you can find SSC, Dakhil, PSC, Ebtedayee, JSC, JDC, HSC, Alim Result, Suggestion, Mark Distribution, Routine, Admission, Job, etc. If You get more update Everyday, Please like our Facebook Fan Page and get Updates.